USAF GROKS Virtual Training but some unGROK for whatever reason - SHIRLEY USAF knows what quality they produce. "The Air Force has cut as much as five weeks from the time required to teach novice pilots to earn their wings, a move that will help it replace rapidly departing veteran aviators...."
By the By only graphics can be reproduced - WhY? Becuz I ain't gonna subscribe being in the Great South Land and all y'all. 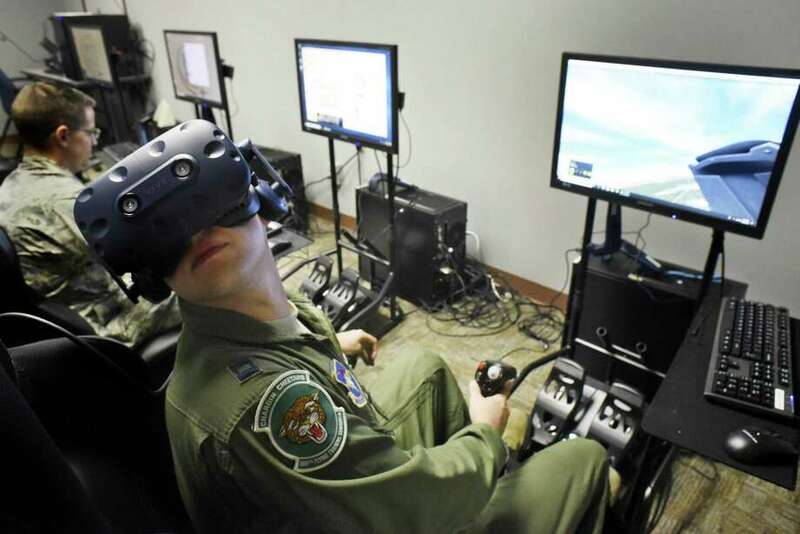 "It now takes the U.S. Air Force an average of 49.2 weeks to train a pilot under the undergraduate pilot training syllabus. Previously, it was 54.7 weeks. The service was able to acheive this by making students fly simulators early in the syllabus and more flight time on the T-38 and T-1. However, some instructors are worried that the new system is risky as the training syllabus has been altered radically. Instructors pointed out that students who do well in simulators might not perform as well in the actual cockpit – which is loud, hot and sweaty...."
I'm not getting this... Students are getting 'more flight time on the T-38 and T-1' so what's the problem? Without access to all the text in the main article perhaps this quote - out of context - will make more sense - in context? "...However, some instructors are worried that the new system is risky as the training syllabus has been altered radically. Instructors pointed out that students who do well in simulators might not perform as well in the actual cockpit – which is loud, hot and sweaty...."
Two great presentations on JSE at NDIA's 2018 Test. "Cubic has awarded the first contract related to equipping a second batch of 500 Lockheed Martin F-35 Lightning II Joint Strike Fighter (JSF) aircraft with its P5 Combat Training System (P5CTS). Global Defense has contracted Leonardo to integrate the internal subsystems of its integrated air combat training system aboard 500 JSFs, bringing to 1,000 the number of aircraft fitted. Under the contract, announced on 19 November, the P5CTS internal subsystems will be delivered to Cubic over the next four years as part of Lockheed Martin's F-35 production lots 12-14. The US military currently uses the P5CTS as its programme of record instructional aid, giving it a real-time breakdown of the scenarios being run and the missions being flown through the live monitoring and recorded mission data of air-to-air, air-to-ground, and surface-to-air training scenarios for real-time training and post-mission analysis. While current fourth-generation aircraft carry an external pod, the airborne sub-system for the F-35 is internalised and integral to the aircraft to maintain the platform's stealth characteristics (all F-35 customers except Israel, which has its own system, will use this)…." "ORLANDO, Fla. — Air Force and Navy officials are declaring success for a joint technology demonstration that tied jet fighters in the air with pilots operating simulators on the ground, who could all fly against computer-generated adversaries. A final report on the Secure LVC (live-virtual-constructive) Advanced Training Environment (SLATE) demonstration was due at the end of December, but organizers a month earlier said that the exercise went better than expected. “We’re not supposed to say that it was a very successful technology demonstration — that’s supposed to come from our senior leaders — but it was a very successful technology demonstration,” said Wink Bennett, SLATE research lead at the Air Force Research Laboratory. “It was beyond our wildest hopes,” he added. A team lead by the Air Force’s 711th Human Performance Wing of the Airman Systems Directorate, Warfighter Readiness Research Division took more than four years to set up the exercise. The demonstration then took place over an eight-month period at Nellis Air Force Base, Nevada. This was created out of “unobtanium.” It had never been done before, said David Noah, AFRL’s program lead for the demonstration. To make live-virtual-constructive training a reality, the team had to develop several key technologies. One was the fifth-generation advanced training waveform (5G-ATW) developed by the MIT Lincoln Laboratory to serve as the datalink. In addition to the new waveform, the training system was served by Link-16 and UHF/VHF voice communications. The second hurdle was ensuring that all three links were cyber secure and encrypted. The aircraft also carried a SLATE pod that contained the necessary software and allowed for “untethered” operations. The exercise used F-15s, F-16s and Navy F/A-18s. Next will be creating links for fifth-generation fighters such as the F-22 and F-35. That will be challenging, but doable, the organizers said. “That is yet to be solved, and it is a horse of a different color, but we have a plan to go fix that,” Bennett said. The underlying technology is platform agnostic, Noah said. It could work on other types of aircraft, ships or space systems." 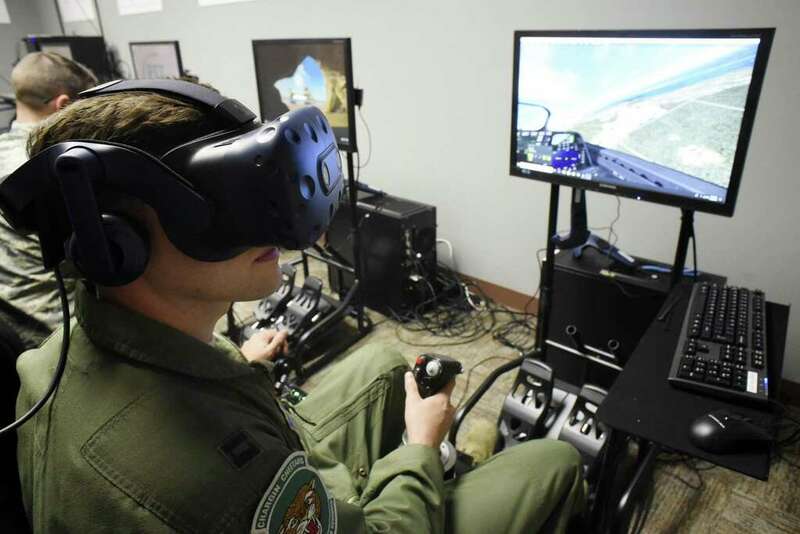 "EDWARDS AIR FORCE BASE, Calif. (AFNS) -- The 412th Electronic Warfare Group is one step closer to bringing the Joint Simulation Environment to life at Edwards Air Force Base. The 412th EWG recently began work to pave the way for ultimately building a new facility to house the JSE. JSE is a scalable, expandable, high fidelity government-owned, non-proprietary modeling and simulation environment to conduct testing on fifth-plus generation aircraft and systems accreditable for test as a supplement to open-air testing. The 72,139 square foot JSE facility planned for Edwards AFB is actually one of two, the other will be constructed at Nellis Air Force Base, Nevada. As part of the construction efforts, the 412th EWG is also looking to hire more than 100 new personnel between both facilities -- primarily engineers with software skillsets. The Edwards AFB facility will focus on developmental testing while the 50,967 square foot Nellis AFB facility will focus on operational testing. However, both facilities will be built with similar hardware and software configurations so both buildings will be able to augment each other’s capabilities, said Humberto Blanco, JSE project manager. The JSE facility is also being designed with that flexibility in mind. While construction for the JSE is still months away, the 412th EWG is already ensuring that when it comes online, “growing pains” will be as minimal as possible. Construction crews are reconfiguring simulator and computer systems inside building 1020 at Edwards AFB, to make room for a small-scale JSE system that 412th EWG engineers can utilize to ensure all systems are operational and internal issues are rectified before the actual JSE facility is finished. Having a small-scale instantiation of the larger facility also allows 412th EWG customers to concurrently utilize the facilities without service interruptions, Blanco said. “It will allow us to bring JSE simulators online and begin to experiment and to learn,” Blanco said. The reconfiguring inside building 1020 will afford software engineers the time to be familiar with the incoming systems, which will benefit customers, said Gerald Lockwood, Modeling and Simulation flight chief. The overall goal of the JSE is to allow the testers and engineers the capability to test multiple platforms during the developmental and operational testing phases of a platform. Azzano said that he foresees the JSE becoming a step in the testing and developing of Air Force platforms in the future and that, in just a short time, AFTC customers will see its value. While the groundbreaking for both facilities is not scheduled until May 2020, Blanco said that when the buildings do come online, his team will be ready. “Instead of waiting until the buildings are finished, we are developing these lab integrations here, so when the buildings are finished, we can hit the ground running,” Blanco said. “It’s very exciting times for the Air Force and the modeling and simulations community. I tell people on the outside that this is going to be the best video game ever.”"
Incredible achievement, Kudos to all involved. Should save a ton of gas and wear and tear in the process.